On the first Saturday in June, Malaysians celebrate the birthday of the Yang di-Pertuan Agong (king of Malaysia). The king's birthday is an official public holiday in Malaysia. The Yang di-Pertuan Agong is the elected monarch of Malaysia. 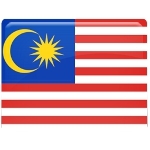 Malaysia is one of the few constitutional monarchies in the world where head of state is elected. The king is formally elected to a five-year term by and from nine hereditary royal rulers of the Malay states. The title of Yang di-Pertuan Agong was adopted in 1957. The first Yang di-Pertuan Agong was Tuanku Abdil Rahman who served from 1957 until his death in office in 1960. The date of the birthday of the Yang di-Pertuan Agong is a ceremonial date. The holiday always falls on the first Saturday in June, its date does not change depending on the actual birthday of the current head of state. It is similar to Sovereign's birthday in the United Kingdom in this regard (which is not surprising as Malaysia had previously been a British colony). King's birthday in Malaysia is a non-working holiday, which is marked with numerous festive events and ceremonies throughout the country. Traditionally, the most spectacular celebration is held in Kuala Lumpur, the federal capital of Malaysia. It includes a military parade and a performance by a military band.